I know I’m a day late, but I wanted to report on the new Exodus movie that came out this weekend. Yesterday, I had a chance to review it myself, and give a different critique than I’m reading on the internet. I have to be honest: I’m really concerned with the level of criticism coming from some that thought Exodus was going to be an account of the Hebrew story as read in the Bible. It feels almost like some people wanted to see a film that confirmed the Sunday School Lesson they learned as a child, instead of seeing a film with broad artistic liberty often accompanied with a Hollywood film. But I’ll save that for the critique. Here we go. 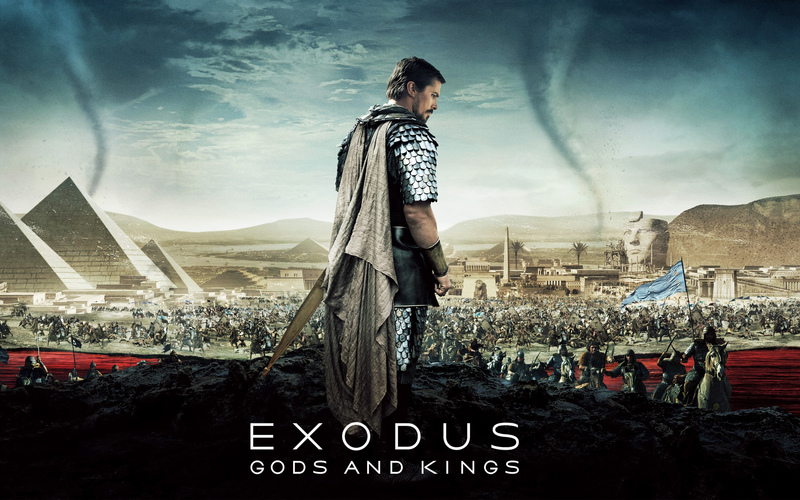 If you’re looking to go to see Hollywood confirm an accurate version of the Biblical Story of the Exodus, save your money. Sure, there’s a Moses, a Pharaoh, there’s Egypt, and the Red Sea, there’s a burning bush and a massive slavery message to deal with, but that’s about where the story resembles the Exodus account in the Bible. Christian Bale did a great job as an actor given this monumental role, but there’s obviously a disconnect between the Moses of the Bible and the character on the large screen. Bale’s Moses is a snarky realist living in the court of Pharaoh. His role as an advisor to the King is one that takes on a rough edge of service often indicating he’s almost on par as equal to Ramses growing up. It may be a minor difference than the Moses I envisioned in my head, and it might simply be a script writing issue. He does have moments of a man with deep moral conviction when he routes the excessive spending of a Vice Roy in charge of the Hebrew Slaves. But overall, he comes across as a self-centered narcissist who is adored by the Pharaoh but suspect by everyone else in the king’s court. When the time comes for Moses to lead the people, he’s visited by God at the burning bush in the form of a young child. The young child tells Moses he needs a general to “Fight” for the release of his people. Moses takes up the military command and begins training people, instead of (according to the Biblical Account) approaches Pharaohs court with a message that simply states, “I Am” sent me. God is also represented as a bloodthirsty war monger who delights in the death of millions, which may or may not fit your theology; but certainly calls into question, “Who is God?” It may be a subtle difference, but for those looking for that letter of the scriptures on the big screen, may be disappointed by the direction Mr. Scott decided to take. As far as the Egyptian Plagues, there’s an obvious lack of supernatural. They are explained away as natural events that compile some scientific layer to convince the Egyptians it’s time to eradicate every Hebrew from the land. The special effects are AWESOME, but without a supernatural God seemingly commanding the events to happen, the scientific explainable consequences become more of a happenstance than a miraculous hand of God moving through the land. As I sat in the theater at the end of the film I was moved by a couple of “morals” of the story. 1. Moses had to deal with the commands God was orchestrating to call him to lead this massive group of people out of Egypt. I thought Bale did an amazing job wrestling with what God called him to do jux opposed to the way of the world. He has to leave his family, risk everything, and witness an inordinate amount of death plagued on his Egyptian friends. I felt like this story line is often missing from our view of the historical Moses from a 21st Century Western Teaching. 2. Slavery is abhorrent. I don’t know the last time I heard a message from the pulpit on the effects of slavery on the Hebrew people living in Egypt. I think it’s important that those who try to deal with scripture accurately detail the awfulness of slavery and oppression. Sometimes we get so sensational about the plagues and the Red Sea Crossing, we forget the actual reason God called Moses to get the people out from under the long arms of government oppression. 3. I’ve never thought about Moses the leader after the Red Sea. How should he govern? Would God lead, or would man lead? Were the 12 tribes something Moses came up with or God ordained? Of course I know the story, but I’ve never thought about the reality of leading that many people through the wilderness of liberty. I read Exodus from a different viewpoint last night. Look, it’s a movie. It’s not the Bible. It’s a story. It’s not God’s word. It’s one version of a story told through the ideas of a director that may or may not think like you do. It’s not the end all be all. Sometimes we need to remember, just because it’s in the theater doesn’t mean it’s true. Just because it’s on a larger than life screen, doesn’t mean it’s an accurate account. It may just be a fun way of telling a story that’s shaped billions of people’s belief system. And what may be a value to many is, they’ll go back and read the account as told through the Bible, or the Torah. I, for one, am excited that Hollywood is bringing stories like Noah and Moses to the big screen. When I sit in the coffee shops here in Durango, it’s a wonderful lead in to conversations about what I believe and what others might have seen. “Be careful not to sacrifice the good for the perfect.” Sometimes the good can lead to a place where people can come to see God in a different way. It may just be the bridge you need to help cross over to someone’s view of God concerning slavery, oppression, and the way God works in the lives of those who desire to serve Him today. Overall, Go see it with a critical eye; but be ready to read the story in your own Bible, and see what differences you come up with. It’s a GREAT way to use your own brain to think through how God moved in the time of Moses. Previous After High School, Then What? Andy…thank you! It always amazing, and just a bit humorous, when people confuse a movie with the real written information. It’s not just for/from the Bible that one cannot put in everything in a90-120 minutes film. All of no story is ever on the big screen. You and I both know that we’ve heard sermons from others who stretch the story to make it fit their points. BUT, my friend, your post, as per usual, invites us to think, ponder and glean from what the intent of the story really is. In past months I’ve heard preachers calling many of the Old Testament characters “Christians,” who lived a few centuries before Christ. Oh well. The intent of the story in Exodus (which we’ve yet to see…) at least gets us thinking about the magnitude of the project Moses was put in charge of. Thank you for helping us see, think, live. Keep those thoughts coming. By the way, have you heard the story about the Jehovah’s Witness, the Mormon, and the Southern Baptist who walked into a bar? Me either. Just testing you to see if you read these comments. lol Thanks-filled for you and yours…to the max!! !